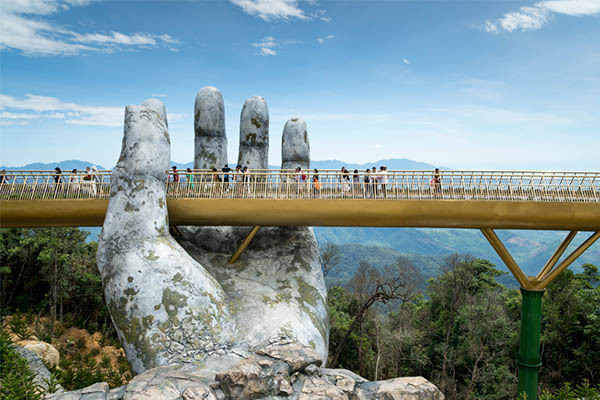 It is almost like the intervention from God, did a colossal pair of limbs break through the earth’s surface to lend a helping hand for Cau Vang, or ‘Golden Bridge’ in Vietnam. Recently opened in June 2018, Vietnam’s latest architectural marvel has drawn flocks of tourists to cross the golden thread of walkway, erected more than 1,000 metres high above sea level to overlook the majestic, forested landscape of Ba Na Hills. Snaking along a cliff edge, the bridge itself stretches a length of an estimated 150 metres. Visitors can also take delight in the blue vibrancy from Lobelia Chrysanthemum, planted along the pathway on the bridge. 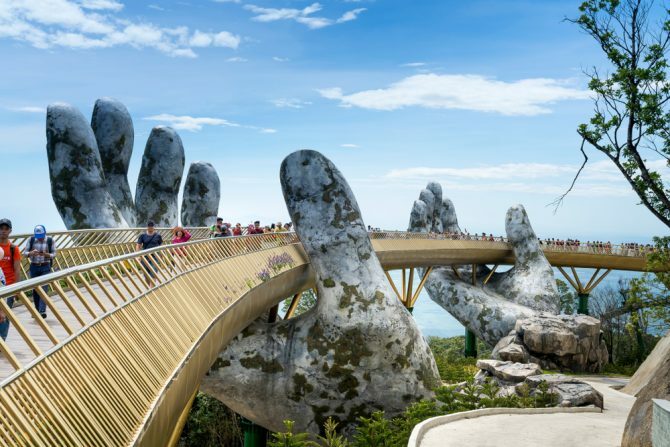 But soaring views aside, the Golden Bridge’s major attraction is undoubtedly the two massive stone-coloured human hands, which seems to grapple at the overpass. So are the hands created to evoke a sense of divine assistance, or to reclaim the bridge back into the earth? According to the builders from at TA Landscape Architecture, the giant hands of God are designed to pull a strip gold out of the land. To see the Golden Bridge, you’ll need to drop by Ba Na Hills in Vietnam’s Da Nang. The distance from Ba Na Hills from the main city of Da Nang is roughly 40km, which is a two-hour drive. Aside from package tours and hired car service such as taxis, you can also opt for an Open Bus ticket price is from 100,000VND (est. SGD5), or rent a motorbike at 80,000VND (est. SGD8). There’s also the world-class cable cars to get to Ba Na Hills. The cars leave from Sun World Ba Na Hills Gateway from Dragon Bridge, located in the center of Danang. You can view the cable car schedule here. For adults, a cable car ticket is 650,000VD (est. SGD38), while children under 1.3m are at 550,000vnd (SGD32). The tickets include return and also grant you admission to the resort complex and Fantasy Park.